Deze week was ik samen met Femke Cools te gast in Dublin bij het EUNEC congres over CPD, waar ik sprak over emanciperende schapen. In my country, teachers have long fulfilled a position in the civic-political order I can perhaps best describe as the role of the executioners of government policy. Politicians, media, advisors, experts and novices alike, they all seem to look at the teacher as a voiceless, semi-free employee, who is not to be taken very serious. We are merely, as a leading newspaper has put it, ‘meekly sheep’. We blindly follow the orders of policy makers and school leaders, who herd us like a pack of sheep. Of course this is a caricature, but the message is clear: the Dutch teacher finds himself badly in need of emancipation. Thankfuly, in recent years things are starting to improve. As my colleague Laurent Chambon has put it in the television documentary “Power to the Educator!” our role “is changing from employees to engineers of education”. So what sparked this small revolution? Since a commission led by Jeroen Dijsselbloem in 2007 made clear the teacher is the vocal point of education, sound government policies has been made to strengthen the position of the teacher. These policies are clustered in the teachers agenda and include all the usual suspects of international teacher policy: better teacher training programs with better students, better induction programs and coaching for starting Teacher. An independent corporation has been created to facilitate the program. What is also included in the scheme, is a professionalization program by the name of the teachers register. From 2017, all Dutch teachers are mandatorily enlisted in a central register, where their professionalization activities are administrated. The register is highly controversial, as some see it as yet another example of unpopular topdown policy. Others, myself including, regard it as a tool to set a quality standard for our own profession and as a method to liberate ourselves from the state of ‘meekly sheep’. Then there are those who believe emancipation is only possible when we change the entire civic-political order we work in. In other words: we need to flip our system. This is in a nutshell the vision of the teachers Jelmer Evers and René Kneyber – the latter was recently appointed to the Dutch education council. Though I see more value in connecting and bonding with other stakeholders (‘poldering’ the Dutch call this) I do firmly agree with Evers and Kneyber in at least one aspect of their work: bottom-up initiatives have far greater impact than topdown government policy. This is why the register can only work when teachers claim it as their own instrument to set a quality standard. We might have some well-constructed policies on CPD, we might have a 500 euros personal budget for CPD and available time to spend it, these are all external means. What we need is teachers who are truly motivated to work on their professional development. I believe this is not something policymakers can ignite. For this reason, i am very enthusiastic about a number of bottom-up initiatives in my education system that strengthen the position of the teacher. First there is the LeerKRACHT foundation, who support peer review, intervision and collaboration between teachers. LeerKRAHT has been succesful in recent years, the word is spreading from one school to the other. The plan is to stop in 2020. By then a critical mass should be achieved of schools and teachers who want to collaborate and learn from each other. I myself am involved in two other initiatives: the first is Leraar2032, an attempt to increase the influence teachers have on the curricula. The other is called De Onderwijzers, or The Educators. A virtual learning community for teachers to meet, collaborate and learn from each other. Future will tell if the register comes at the right time for the professional community to claim as our own. It seems like initiatives such as the ones descibed above have sparked a small revolution. 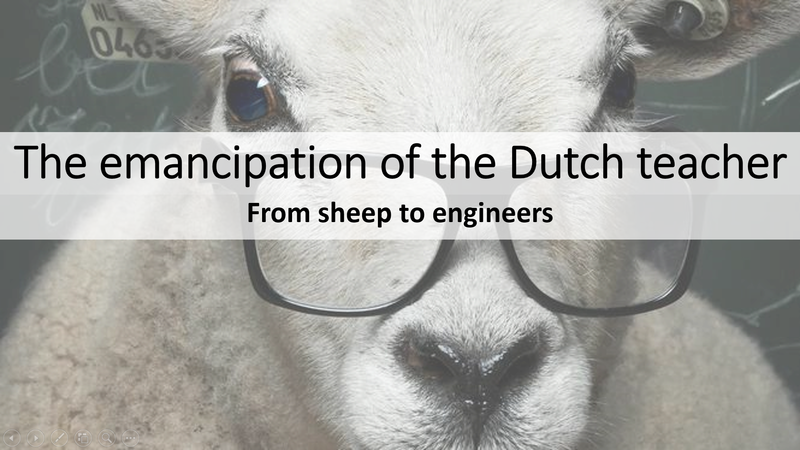 The emancipation of the Dutch teacher seems to be taking form. Ever more often, teachers are taking the stage in the public debate. Whats key in this development is hearing the teachers voice. We want to join the dicussion. No more carrot and stick policies. Its time to start regarding us as the engineers of education we are. Het is te hopen dat ze geluisterd hebben. Goed stuk Jasper! Ik vind ‘De Onderwijzers’ ook een goed initiatief. Lijkt een beetje op de beroepsvereniging die naar mijn idee mist. Is het jullie idee om De Onderwijs daartoe te laten uitgroeien?